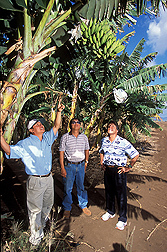 The HAW-FLYPM program is allowing many fruits and vegetables to be grown in Hawaii without heavy use of pesticides. A 32-percent return is an excellent yield on a commercial investment; it is a superb economic return for an agricultural research project. 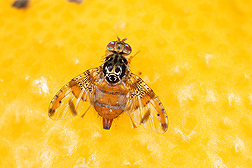 But a 32-percent return is just what has been achieved by the Hawaii Areawide Fruit Fly Pest Management Program (HAW-FLYPM), a cooperative effort of the Agricultural Research Service, the University of Hawaii Cooperative Extension Service, and the Hawaii Department of Agriculture to control four types of exotic fruit flies. The pests have made it almost impossible for Hawaiian farmers to raise food crops without heavy use of pesticides. The goal of the project is to develop ways to control these four fruit fly species—Mediterranean, melon, oriental, and Malaysian—which have been devastating more than 400 fruits and vegetables in the Hawaiian islands for 100 years. Susceptible crops include citrus, coffee, eggplant, guava, loquat, mango, melon, papaya, passion fruit, peach, pepper, persimmon, plum, star fruit, tomato, and zucchini. The economic consequences of fruit flies have been exacerbated as Hawaii has focused more on these diverse crops and less on plantation-grown crops such as sugarcane and pineapple. Tsukasa Yamamoto (left) of B.E.S.T. Farms and ARS technician Mike Klungness examine a patch of fruit-fly-free tomatoes. After participating in the areawide pest-management program, cooperators can now diversify and grow once-abandoned popular fruits and vegetables. Within 3 years of startup, the researchers knew that the program they had put together could work and that growers could physically apply it for themselves. Sustainability—a program that farmers would carry on by themselves once the research program ended—was always one of the key objectives. “Right from the start, the goal of suppressing the fruit flies looked scientifically feasible, though it took considerable effort to fine-tune the system and make it work for the crops that each farmer grows,” explains entomologist Roger Vargas, who heads the HAW-FLYPM program for ARS at the agency’s Pacific Basin Agricultural Research Center in Hilo, Hawaii. But scientific success was only half the issue. The other half was whether the program made economic sense. As its name states, HAW-FLYPM is an areawide program. That means reducing the pest population by a concerted biological control effort in a large area, not just in a single field or through spot treatments. One of the unique aspects of ARS’s multiyear areawide programs—there are 14 others—is that they are required to do an economic cost-benefit analysis. So the HAW-FLYPM program contracted with economist Andrew M. McGregor to analyze the total benefits to farmers, households, and the public. He also looked at the national and international benefits of controlling the four invasive fruit flies. As far as costs, about $14.4 million from ARS have been spent on the HAW-FLYPM program since it started in 2000. The Hawaii Department of Agriculture and University of Hawaii Cooperative Extension provided additional in-kind assistance. These costs do not count the salaries of the ARS scientists and technicians who worked with the program but do include the costs of educational materials to recruit farmers and gardeners. After 2007, it is projected that the State of Hawaii will spend about $250,000 for continuing extension and public education. The benefits were measured in three categories: (1) already-achieved increases plus forecasts of their continuing, (2) benefits based on likely outputs over the next 5 years, and (3) benefits based on possible outputs over the next 10 years. These benefits add up to a hefty 32-percent return on that investment of $14 million over 15 years—and that doesn’t count the substantial indirect benefits, such as increased agricultural employment, nor environmental benefits that don’t have a direct dollar return. “Even when you use the most conservative economic analysis without including the ‘possible benefits’ category, the rate of return still came to a very healthy 27 percent,” says McGregor. Economic return comes from a variety of revenue streams. For example, field sanitation and trapping are less expensive than pesticides and spraying. Kamuela County extension agent Randy Hamasaki estimates the annual direct cost of spraying organophosphate pesticide to control melon fly in commercial cucurbit production in his area comes to $1,680 per acre, not to mention the health and safety costs. Another source of increased income is the potential to expand in both number of crops and in number of acres planted, according to McGregor. 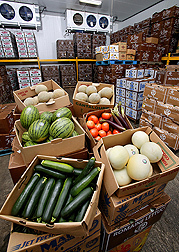 Substantial increases in supply did initially lead to a drop in farmgate prices for some crops, like cucumbers and melons. But prices rose above pre-HAW-FLYPM levels as demand increased in response to consistently available, high-quality local crops. Hotels and restaurants have become especially important high-value markets for local produce as their chefs develop confidence in growers. Entirely new markets have also become possible with HAW-FLYPM, such as vine-ripened tomatoes. 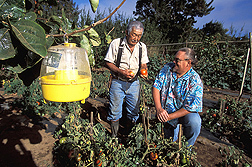 Parts of Hawaii offer ideal tomato-growing conditions, but fly damage had made vine ripening nearly impossible. Today, Waimea restaurateur Peter Merriman is paying local farmer Erin Lee 40 cents per pound more than market price so he can offer his customers the flavor of her vine-ripened tomatoes. Beyond the direct economic return to commercial growers, the HAW-FLYPM program has also provided economic, social, and environmental benefits to the Hawaiian regional economy, to the mainland United States, and to other countries. Home gardeners have also gained from the program, making it possible to raise many crops in their yards without resorting to pesticides. There is a tradition in the Hawaiian culture of bringing fruit and vegetables when visiting friends and neighbors, and gardeners are pleased to have fruit-fly-free gifts to share. But backyard gardens can act as reservoirs in which a few fruit flies can survive and produce another generation—in effect creating a never-ending cycle for growers, large and small, even when farmers in an area do a good job of controlling fruit flies. So successfully enlisting gardeners to use the HAW-FLYPM program has enhanced the success of commercial growers. 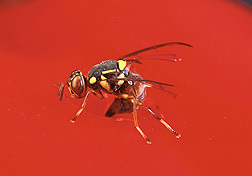 Suppression of fruit flies in Hawaii also has benefits outside Hawaii. California alone has spent more than $500 million eradicating these same exotic fruit flies over the last 40 years. If any of them became established there, it could cost California over $1.4 billion a year in lost markets, export sanctions, treatment costs, and reduced crop yields, plus the loss of 14,000 jobs. 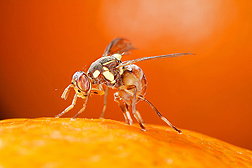 Suppressing exotic fruit flies in Hawaii lessens the chances that they could become the source for outbreaks in the continental United States. Internationally, Pacific Rim countries such as Taiwan, Fiji, Guam, China, Solomon Islands, Papua New Guinea, Vanuatu, French Polynesia, and Australia have also been battling these fruit flies, which are seen as a threat to food security. “Arrival of the Oriental fruit fly in Palau in the mid-1990s can be seen as a biological disaster, the costs of which are potentially far greater than a major physical disaster such as a severe typhoon,” McGregor says. The HAW-FLYPM program can empower Pacific island communities to deal with such a disaster.—By J. Kim Kaplan, Agricultural Research Service Information Staff. This research is part of Plant Protection and Quarantine, an ARS national program (#304) described on the World Wide Web at www.nps.ars.usda.gov. To reach people mentioned in this article, contact Kim Kaplan, USDA-ARS Information Staff, 5601 Sunnyside Ave., Beltsville, MD 20705; phone (301) 504-1637, fax (301) 504-1648. While the Hawaii Areawide Fruit Fly Pest Management Program (HAW-FLYPM) was designed so that farmers would use as little chemical pesticide as possible and still suppress fruit flies, it was never planned to be pesticide free. But the program proved so effective at reducing the need for chemical pesticides that Dow Agrosciences LLC was intrigued enough to develop an organic offshoot of GF-120, a protein bait containing spinosad that is used to attract and kill pest fruit flies. Monitoring and trapping fruit flies is one of the principal steps in HAW-FLYPM. The organic version is called “GF-120NF Naturalyte.” It’s the result of just a few minor changes to the original formulation and has been certified by the Organic Materials Review Institute and the USDA National Organic Standards Board. Furthermore, Dow Agrosciences was able to expand the bait’s Environmental Protection Agency-approved uses to an “all crops” label, including coffee and persimmon—two crops important to the Hawaii organic market. Today, all sorts of crops are showing up in Hawaiian markets carrying the organic label—without fruit fly damage. 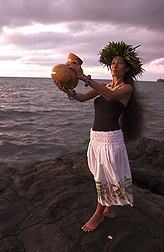 A ceremonial ipu is held by traditional dancer Kanoe Lake. Ipu, Hawaiian for the hard-shell gourd, has always been an important part of the island culture. It’s used as a drum in hula dance, and it’s a traditional way to store food or water. But the melon fly had made it almost impossible to grow the traditional ipu gourds in Hawaii. 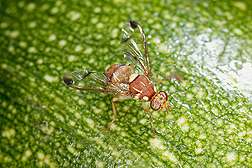 Morby herself had little success growing the ceremonial gourds until she enrolled in the Hawaii Areawide Fruit Fly Pest Management Program (HAW-FLYPM). “The first day the trap caught at least 100 fruit flies. It was such a pleasure to see the dead fruit flies pile up,” Morby says. "Fruitful Returns From Fruit Fly Management Project" was published in the February 2008 issue of Agricultural Research magazine.